It has been a while since I posted about vertical axis, but I can’t help noticing that everybody wants to do it, and they keep asking me for help. I get emails, and people put comments on this blog. They all think there is some advantage to using a vertical axis turbine. I don’t know what advantage there can be. Please help me understand! “VAWTs don’t need towers.” Hmm. Why don’t they need towers? Can they work in places where there is no wind? The reason we put wind turbines on towers is because wind turbines need wind. In spite of what you may read on the internet, modern wind turbines are pretty efficient already, and do not need to be re-invented. What they mostly lack is wind. A 10% increase in windspeed gives 33% more energy. How to get more wind? Use a tall tower. Windspeed increases with height. There is no useful wind in a backyard or under a tree. The only reason that VAWTs do not need towers is that they are not wind turbines for producing energy. They are just greenwash ornaments for architects to use to tick boxes about footprints. Performance claims for VAWTS are invariably inflated. Pretty often they use more energy than they generate. It takes power to motor a VAWT up to speed and this is a waste in a lot of places because they do not have a tower, so they will never see a proper wind. “They are silent in operation” OK I admit I have never actually heard one running. But the noise most people notice from small wind turbines is alternator whine and I see no reason why being vertical would change that. For me it’s music anyway. Blade noise depends on speed of movement and is mostly white noise that is easily masked by other sounds. Windside Savonius turbines made in Finland are very beautiful. I will admit that Savonius rotors turn so slowly that they could be silent. That’s a lovely looking type of VAWT but so slow and inefficient that the energy it makes is very expensive. They turn at low rpm and so they need a heavy alternator which is expensive. That’s one reason why modern HAWTs have fast-running blades. I’d love to see them around the place but in reality solar is so much cheaper that they would only be ornaments. “They don’t kill birds.” In forty odd years of living and working under small wind turbines I have only seen two dead birds. A lot more have been killed by the flying into the window of my office. Not to mention my cat… Anyway why should birds be less likely to be killed by a VAWT? Because they stand still mostly? “They are more efficient than HAWTs.” There is no way that a VAWT can be more efficient than a HAWT. The blades spend about half their time moving in the wrong direction for a start. I have never seen evidence of higher efficiency and I have never heard any expert give a reason why they should be more efficient. For some reason VAWT manufacturers are even more prone to exaggerating performance than HAWT manufacturers. Don’t believe either of them! Look for independent test data. Good luck with finding a VAWT that has been independently tested and comes with a performance report from NEL, SWCC or NREL etc. Well to be honest the Quiet Revolution shown above has been tested but the results are secret and the turbine is no longer listed as MCS approved. More about QR..
“You are obviously biassed against VAWTs and your mind is closed to new ideas.” This is what people say to me. It’s true that I have never seen the point of VAWTs but my mind is open. I really hope to hear from people who have owned VAWTs and produced a lot of energy and the blades did not fall off, and they are happy. Please get in touch with me! I need educating. All I ever see is bad news, and the same old misleading hype. Lets get some good news out there! I am happy to help people who are building VAWTs by suggesting how they can make their own alternators. I do get a lot of enquiries about this. One thing I do ask is please could you find out the range of rpm and power in relation to windspeed? You will need to know the “tip speed ratio” and the “power coefficient” of the turbine. Then we can determine the output of the turbine in watts and its best rpm at each of a range of windspeeds and go to work. Nobody who asks me seems to have a clue about these facts. Again – I need educating! Please VAWT builders do find out the performance parameters of the design based on past experience. VAWTs have been built for a hundred years and more. There must be some data out there. Please could people learn from the disastrous history of the vertical axis wind turbine, and then go forward with eyes open to the realities? “What’s wrong with vertical axis?” I almost forgot to say so I am glad you asked me that. OK so there’s not much wrong with the Savonius rotor except that it’s grossly inefficient and runs much too slowly for generating electricity, but it is rugged and simple and a lovely thing to look at. When we look at high speed VAWTs of the “Darrieus” type then it’s important to understand the issues there. It’s interesting that the wikipedia page for the Darrieus does not mention the most important word in connection with this turbine type which is fatigue. The blades are subject to reversing lift forces in every single revolution and that amounts to a fatigue machine that ultimately breaks the blades or their fixings. The ones that do not have helical blades also put horrible fatigue loads into the supporting structure (if there is one) so it is impossible to design a suitable tower. I am told that these are “just a materials problem” but you’d better solve that because it is the death of most VAWTs. Oh, and even the electrical network has to deal with pulsating power coming in. Also the Darrieus design is not self starting so you will need to figure out a way to start it up. Although it can start in turbulent conditions when you least expect it so if you want to keep it stopped you’d better have a brake. You are going to need that brake in strong winds because there is no effective pitch control system that is not going to wear out. Maybe you can use a big alternator and stall it so long as the wind does not get too strong. What else is wrong? Cantilevered loads on the bottom bearing can be an issue. It’s probably worth using guys to the top of the machine. I think there were a few more issues that I forgot. But then I completely forgot the entire list of reasons for doing this in the first place. Can somebody tell me? Why vertical axis? I simply don’t get it. This entry was posted in Vertical axis wind turbines (VAWTs). Bookmark the permalink. 33 Responses to What is it about Vertical Axis? Hi Hugh, happened on this post while looking for diy wind turbine info. I have some bits from a failed small commercial VAWT I bought damaged which I want to re-use as a low wind speed HAWT to supplement our winter power. Anyway I own a small Polish made VAWT now for the past 3-4 years because I could’nt get suitable blade material to repair the broken one I purchased. My point for posting is that I think VAWT’s have a place and if well made by diy’ers can actually generate descent power at low cost. In over two years since I posted this, you are the first reply from somebody with a successful VAWT. This is great news. I wonder if you can give me more details such as make and model and a bit more about the energy production you have recorded over the years? I really appreciate getting some facts and especially some good news about VAWTs because I really need a reason to justify the amount of my time people take up talking about them. If one would be interested to market some good vertical windmill types. There is some good producer in Italy about the new ones. Could You recommend any. And it would be a model which could be used in Scandinavia. Fairly accurate information. I do find it interesting that you focus on Savonius and Darrieus type VAWT’s, nothing wrong with that (they are what most people think of). And I use savonius wind turbines. While there are issues with VAWT’s, especially the Darrieus type (areodynamic boundery difference or ‘lift’ force driven), there is the other side of things. I would never recommend a Derrieus type wind turbine, they have major issues. Realistically Savonius type do have the best reliability. There are redirecting impulse VAWT’s that have many of the reliability advantages of the Savonius type, while producing higher speeds. These are very reliable self starting devices that can reach speeds that simplify the drive of an alternator. As to calculating the power potential of a VAWT (either savonius or sidereal impulse types) you can not apply the same equations to them as to a HAWT, the numbers will not match up. A savonius type turbine (with open center) can extract up to 40% of the wind energy into mechanical energy, just at a lower rotational speed than many other types, so the question comes to how to drive an alternator, as gearing it up has the disadvantage of mechanical losses, and making a low speed alternator that will keep up has the disadvantage of costing quite a bit in copper and rare earth magnets. Though a savonius type VAWT can produce a significant amount of power, and is what I use (I gear mine up, and have a clutch to allow them to spin instead of dumping power or breaking speed, it is hard to have a savonius spin to fast even in high wind). Yes it is true that my savonius wind turbines are far from the most efficient, though they produce power at low speed, with less maintenance than the HAWT’s I have used. My turbines are in an area surrounded by mountains, so savonius makes since here. Yes I have PV panels, though I can NOT make modern PV cells, I have to purchase them. I can make sovonius wind turbines, and I can make alternators. This makes long term maintainability more practical with VAWT’s than with Solar. We have tested the worlds first morphing wing turbine. The BRAYFOIL wing can change section camber, thickness and automatically sets the correct angle of attack to the apparent wind at all times. It does so instantaneously, without siding joints, separate panels like elevators or ailerons, and is maintenance free, having no joints in the surface. The simple mechanism operates on a cam and can be designed to be highly robust, and the surface sheet of the wing works well below yield stress, and can therefore flex with an extensive lifespan without fatigue. A wing that forms a perfect sinusoidal lifting shape on the upwind and downwind parts of the cycle and changes shape to provide lift on both sides of the cycle is now possible with this new invention. The ability to provide optimum shape at all parts of the cycle increases power well beyond that possible at low wind speeds using a HAWT. 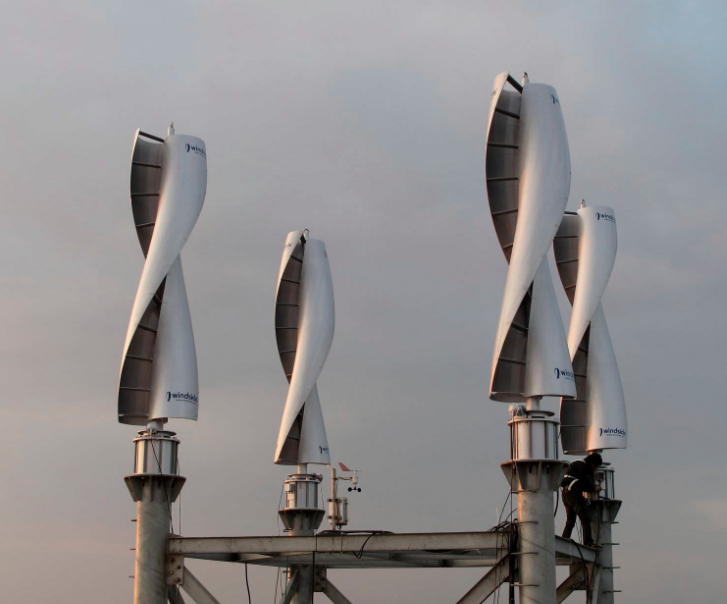 Turbulent air is not a problem to the design, so large scale embedded power is now possible from wind. It will be interesting to see if you are still in business in one year from now and your claims turn out to be true. We see a lot of similar claims being made over the decades but they do not translate into a profitable product that delivers value. Low wind sites are really not so suitable for wind turbines whereas VAWTs are less efficient than HAWTs on good sites where wind turbines should be located. Let’s hope you really do have something new and better, not just the same old hype, but you will be hard pressed to compete with cheap PV on low wind sites. I read your article. You took time to write it in a comprehensive way. It is really great to read. Coming back to your wish “I don’t know what advantage there can be. Please help me understand”, you wrote at the beginning of your article, may I suggest you the following. First, I must say, I agree with everything you wrote in you article. Your arguments are correct. However, I would recommend you to modify just a little bit the way you talk about Savonius shape. Your article says: ” OK so there’s not much wrong with the Savonius rotor except that it’s grossly inefficient and runs much too slowly for generating electricity, but it is rugged and simple and a lovely thing to look at. “. Your terms “grossly inefficient and runs much too slowly for generating electricity” might be a little bit “too much”. To be more precise, savonius shapes are efficient, at low wind speed (1 to 3 Beaufort scale), and they are not efficient compared to other shapes for medium to hight level of wind speed (4 and more Beaufort scale). Most of people using wind turbines, put they wind turbine where wind speed is quite medium a along the year (or they should use it in those configuration of wind). And, to get this wind speed, people should place their wind turbine more than 10 meters above the ground, in order to be aligned with measurements averages calculated by meteorology, and in a place where ground rugosity factor is very low. Then, it is obvious that most of people using a wind turbine, use it in a place where the wind is quite medium. And, in such places, Savonius models are less efficient than other shapes, particularly, than non vertical axis wind turbines. Unfortunately, there are a lot of places, where the wind is, most of the year, between 1 and 3 Beaufort scale: places where the wind is low; places where rugosity is hight – near towns, in villages, inside forests, not facing ocean, etc … For such bad places – bad places in term of wind energy – a Savonius will be really more efficient then other shapes. Well, saying that, what about the electricity generating level at low wind speed ? Comparing with hight speed rotation wind turbine using low number of magnets/coils in their generator, you are right when you write “A savonius …/… runs much too slowly for generating electricity.” But to be correct, you might write a little about generating electricity when rotation generator is very low. Some of big and giant wind turbines, turn slowly, but their generator turn quickly. What does it mean? That means, that, to compensate the slow of the blade turns, the speed of magnets impulsions (let say hertz), must be multiplied by a system: a rotation speed multiplier; or a very large diameter of generator. Thus, using a savonius a low wind speed, with low rotation speed, could generate quite a good electricity energy if a rotation speed multiplier or a larger diameter size of generator are chosen. Because the savonius has a higher torque than HAWT at low wind speed, that could be a solution for most of bad wind places. In that way, I would say you might modify some small pieces of your article when savonius shape is cited, even if, we all agree, VAWT are obviously less productive than HAWT in standard “enough-wind-places” configurations. Thanks a lot Hugh and all, for what we do for trying to get pieces of energy gives by the sun on the earth generating winds in all places, and transform it into electricity for human usages. i am not sure why you claim that savonius turbines are more efficient in very light winds. But the important thing to consider is that there is so little energy in very light winds that it is much more practical to use a PV panel. Even if the savonius is more efficient (which I do not believe actually) there is no value in using wind turbines in such places. The energy in the wind varies with the cube of the speed, so they need to be placed in a good breeze to be useful at all. It is true that you can produce electricity using low rpm. But it is much more expensive to make an alternator that works at lower rpm. So again the money is better spent on solar pv. Or use a higher speed rotor (horizontal axis) and put it on a taller mast/tower and use a higher speed, low cost more efficient generator. Again I don’t understand why we need vertical axis. sorry. I never said vawts make more power than hawts. My original post is still true. As for Peter Sharp. He continues to dream and make paper models. He has never made a full size vawt. Failure to follow his papers on how to make one is most builders downfalls. He gives dimensions annd the most important being diameter of the turbine. It will not work well at small diameters because it cannot keep up with the pitching speed required. If you make the diameter over 6 feet and use a gearbox to drive the alternator at a high rpm you can translate the enormous torque into rpm. I actually made a vawt with an 8 foot diameter that had a tsr of almost 4, and it had shape shifting blades that would change camber passively. It worked well but only in wind below 20 mph and it became very noisy at that velocity. So I’ll say it again hawts make more power than vawts but they both have advantages and their special uses. It’s also fun and nice to try and develop newer technology than work with old established technology that has most of the bugs worked out. I cannot give you any performance figures on any vawt builds because I do not have any wind to speak of at my site. I have built both HAWTs and VAWTs. The 4 HAWTs were based on Hugh’s plans from his books. The first one built is now ten years old and is still generating electricity for the house. They get pulled down once a year for maintenance ie blade painting, grease bearings etc. Never had a bird strike yet. Never had a noise complaint. I have built several VAWTs, each based on a different design. None of them have lasted more than a year outside. It’s structual failure or bearing failure. Peter Sharp’s design performed the best for power generation compared to the other VAWT designs but still still suffers from structual fatigue. I have also had at least 2 blade hinge failures a year on the Sharp VAWTs. You could argue that I need to invest in more exotic materials, better engineering, better plans. Sure. But when I can build a HAWT from cheap Spruce wood and steel that lasts at least ten years with no major failures, cost about 1/3 of the same size VAWT, and over the year generates about 3 times Kwhrs of my VAWTs, I go with the HAWT design for cheap and reliable electric power generation. In my experience hawt blades are solid material that in failure mode, scare the heck out of me and I wouldn’t want to be under one that is spinning at 800 rpm for fear of loosing some appendages. Vawts on the other hand usually have light weight hollow plastic or fiber/foam blades. They don’t come close to hawt power but are great in special applications and can be placed closer together in a wind farm. They both have their own place and can coexist. Hawt blades are usually hollow or foam filled. Maybe you are thinking of the sort of HAWT you’d get at Missouri Wind and Sun or the like, which is not actually representative of the wider industry? I make my blades of wood. Rpm would typically be around 100-400. I have heard the “placing them closer together like a shoal of fish” argument too but see no virtue in that either. I guess some people just like VAWTs and that’s it, and they will find all sorts of reasons to justify their choice even if it makes no practical sense to use them. Those of us who actually want to get useful power will choose a site with good exposure and put a HAWT up as high as we can manage and get results. I don’t mind VAWTs so long as they are recognised as ornaments, rather than seen as some kind of new revolutionary invention that has numerous advantages. It’s a myth. Vibration and failure of darrieus vawt and lack of self starting is due to design. The eggbeater type is not self starting and vibrates and fails due to the two blade design. The H version with three blades works well. There is even a Savonius design that actually get tsr over 1.5. ( normally 0.85). A vawt can be attatched to the corner of a building to take advantage of wind in an urban setting. Simplicity: There is only one moving part. A HAWT needs an extra bearing to steer into the wind. It also needs some way of furling when the wind is too strong. Protection: It is possible to stop a VAWT electronically when the wind is too strong. When the speed is low compared to the wind, the torque is low and it is easy to hold it still. Vertical shaft: The generator does not need to be on top of a tower like with a HAWT. It is possible to run the turning shaft to the ground if need be to locate a heavy generator. Blades: VAWT blades are often straight and can be extruded for efficient production. Aesthetics: I don’t like the visual appearance of spinning HAWT; they look unnatural. Noise: VAWTs are generally quieter than HAWTs, and that is a big deal to people who live near them. Bird strikes: HAWTs have a tendency to kill birds. Failure mode: A HAWT can send a blade flying toward the ground with lethal speed. VAWT blades tend to dissipate their energy to the air before hitting the ground. Granted there a lot of drawbacks to them. Efficiency is just one. But there is still a lot of room for development which will not be done without enthusiasts trying new things and ideas. And the outcome could be very elegant. Thanks. I guess we are going around in circles though as I see nothing new here. Fatigue is inherent in the Darrieus including the H rotor because of reversing lift forces. Savonius is still too slow even with TSR reaching 1.5 and only has the advantage of being silent and reliable, but can never be economic especially not on low wind sites where people favour VAWTs. It’s all very well to quote the supposed advantages such as one less bearing but they simply do not deliver in reality. I see no reason why Hawts should kill more birds, and in any case it’s a non problem compared with windows and cats. As for blades flying off this is much more likely with a Darrieus than a HAWT in the first place and I see no reason why it should do less damage. Room for development, I agree but the efforts of the last century have not fixed the issues so I see no reason for optimism there either. I think it boils down to whether you want an elegant toy on a site that is unsuitable for a wind turbine. If you do and you can afford it then fine go ahead, but I hope it does not persuade people that wind energy is a waste of resources. Properly done on a good site with a HAWT then it can be quite viable. Good luck with your projects too. Thanks for your contribution to the Solar Energy revolution. IMHO the interest in Dynasphere wind turbine [still not ready yet] is that along with looking pretty awesome it’s made of recycled products. Theoretically in some post-armageddon world we could potentially make these ourselves. Michael Reynolds agrees with your point in clip that HAWTs produce more power and also your point that energy use minimisation is the key. Clarifying my comment. The Dynasphere wind turbine is a VAWT and a longterm project/dream of Michael Reynolds from Earthships.com – which based on last comment on his website looks like they are still working out glitches. Thanks for the comment and the video link. In the video he shows a horizontal axis turbine stationary while his Savonius (costing thousands of dollars??) spins very slowly but if you look closely it is not using the friction drive, as the motor is not in contact. It’s a lovely thing to look at I have to admit. Maybe his Savonius is more reliable that a horizontal axis (although I understand it’s still not working quite right). But the high speed verticals have a very high failure rate unfortunately, and nobody can explain to me what the advantage is of using one of them. So all power to his dynosaur and long may it spin. But I like to make electricity and so I use a horizontal axis one that actually produces useful power. large Darrius machines that were fabricated to US Department of Energy designs from the late 70’s. They were 3 blade machines and were nicely made – and were virtually worthless (except as a tax write-off for their owners). The parasitic draw in a 12 MPH coastal regime was greater than the total production output, and the cyclic pulsation caused a continual maintenance problem for the guys and associated hardware. And birds DID hit the guy cables! I had attempted to convince the people behind the project to go with Windmatic or almost any other Danish HAWT, but they were adamant. I had hands-on experience with several other small scale Darrius and Savonius machines, generally to replace them with HAWT equipment, and while with D.C. Power, we were, in theory, dealers for Ropatec. None of these machines were, in my opinion, worth the money, time and effort to install because of the numerous issues surrounding vibration, low power output and maintenance. Ropatec went so far as to warn that none of their machines were to be mounted on ANY structure that might be occupied by, or even supported people! I discovered this caveat while working up a bid to sell and install a number of their 3 kW turbines on ski lift towers. The frequency was apparently such that it could cause structural failure in steel constructs! On the other hand, they sometimes can make for pretty cool yard art. Please could you clarify that statement? What is this low wind, high speed wind and why is VAWT good for that? I can see that turbulence makes little difference to a VAWT since it already lives in a nightmare of changing wind directions and speeds that usually breaks a blade after a while. I did not think it could be called a Darrieus if the solidity is >0.5. For me the point of the Darrieus is that it achieves a high tip speed ratio and a reasonable efficiency by having a low solidity (few and slender blades) so that the angle of attack of the wind on the blades stays out of the stall zone throughout the full revolution. There’s a threshold you have to get past there. And once you are into such low solidity the starting becomes very unlikely. It only happens when there is a sharp drop in windspeed as the machine idles around due to a previously high gust. Then the tip speed ratio becomes high enough that it can start to work properly. I have learned a bit about vertical axis over the years but never enough to make me want to try one. Wind energy is hard enough to capture without doing that as well. I never could see the advantage. I wrote a reply but your website discarded it. Your reply is there just after the comment you were replying to. It’s not that easy to find and nor is this one. It would be more prominent at the bottom of the page. I will read it now. I have never built a vawt that isnt self starting in winds as low as 3 mph. None of my vawts has ever made a sound except my sail vawt. Materials are very important. And light weght is one important factor. The savonius design can have a decent rpm if it is made tall and skinny like a soda straw, tall gives it torque, and skinny makes it go fast. Alternators are only heavy if you make them heavy , another materials thing. As in all wind turbines, the higher you go the more power you get. Look into Peter Sharps design for a passively pitching cycloturbine. It has huge torque and auto starts. So not all your arguments are valid. Thanks for responding. It’s great to have someone talking to me who knows about VAWTs hands-on. Have you built a few skinny Savonius rotor machines? What sort of output have you managed to get from them? do you monitor windspeed and energy production at all? Can you give us any useful facts that would encourage us to install a VAWT and can you give us a reason why you choose that over a HAWT? As for alternators, there is a fundamental thing there that for a given weight of machine you will find you can get twice as much power by doubling the rpm, and the losses will hardly increase, so higher revs do matter in reality. Yes you can spend more on stronger magnets but whatever you do is likely to be more expensive and/or less efficient than a higher rpm machine. I see that Peter Sharp wrote on my blog a couple of years ago that VAWTs needed more time to reach their full potential. A couple of years is nothing in relation to the many decades of their development but I do wonder, has he got anywhere with them yet? When I ask that question I mean is there a properly tested turbine that demonstrates acceptable energy capture in accurately measured conditions? there are international standards for wind turbine testing and there are also independent test sites. I wonder if there is any wort of evidence of promising performance and of acceptable durability that you can point me towards? Hi Hugh, This is Peter Sharp. Thanks for your interest. I haven’t made any building progress for a couple of years due to my arthritis that cripples me. But I’ve made some additional theoretical progress in understanding my two cycloturbines: the Sharp Cycloturbine and the Bird Windmill, and how to use them. I’ve also been working on energy kite concepts. I’ve realized that my two cycloturbines, although simple to make, are very difficult for most people to understand, including PhD engineers. I’m still trying to find help from universities to develop them, but no luck so far. The Sharp Cycloturbine solves the problems associated with VAWT in general and cycloturbines in particular, at least for small-scale VAWT. The Bird Windmill is extremely cheap and simple to make. But whether either of them will ever get formally tested in full scale is now in doubt. If and when I can, I’ll be posting more videos — of larger models. I have long papers about each of my cycloturbines that I can send to anyone who is interested in learning more. I include videos. I explain why VAWT are inherently more efficient than HAWT, which is the opposite of what most people believe. By the way, my cycloturbines are not Darrieus rotors. They are more basic. Their pitch controlled blades use cord bearings that should be extremely durable (informal testing indicates that), and they cost almost nothing. Their pitch control systems also cost almost nothing and can be quite accurate (but not quite as accurate as a computer). They use centrifugal springs that enable the individual blades to control their own pitch angles accurately. The blades are free-floating, which acts like a suspension system to greatly reduce blade stresses. If a Sharp Cycloturbine has a rotor aspect ratio of over 3.14, it will have a higher rpm than a HAWT with the same swept area (which can reduce the size and cost of the generator), and it will capture more wind energy due to its quicker response to wind gusts. It has strong starting torque and a broad torque curve, so it doesn’t need to operate at a high TSR. The solidity ratio for a TSR of 3 to 4 is typically 0.2. There are many valid criticisms of most other VAWT that simply do not apply to the Sharp Cycloturbine. The Bird Windmill is so radically different in so many ways that I will not try to explain it here. I can see that you have plenty of ideas. Let’s hope that some of the more important ones get tested and validated. I remain to be convinced about many of your claims but the proof of the pudding is in the eating as they say. All I can find on youtube is models with bits of string. They have quite a few moving parts which does not bode well. The reversing loads that have always been the main cause of premature failure in Darrieus rotors are still there. Clearly there are a lot of clever ideas in your work that deserve to be tested. I hope that engineering students have a lot of fun testing them, and learn a lot. I hope that these lessons will be widely published for the benefit of the industry. But until they bear out your claims I am afraid they are simply claims and I am not optimistic to be honest that they will prove true. Thanks for your response. I hope that you will read my entire paper on how VAWT could replace HAWT. You object that a VAWT cannot have both a high aspect ratio (tall) and be extremely wide (short) at the same time, thus implying that a VAWT cannot be both more efficient than HAWT and also have a higher rpm than HAWT at the same time. But it can, because VAWT are so versatile. Just stack extra-wide Sharp VAWTs, with spaces between the VAWT, to create one very tall VAWT. Problem solved. Then to further increase the power of that VAWT, suspend the stack so that it can swing away from the wind maybe 10 to 20 degrees during normal operation. That will expose most of the downwind blade pass to clean air and increase the power by a considerable amount. (Delft wind tunnel research achieved a 35% increase, and there is no reason to consider that to be the maximum possible increase because they used a roughly square VAWT, not an extra-wide VAWT.) The efficiency (if that is the narrow goal) of that stacked VAWT could then exceed what is even theoretically possible for HAWT. However, your comment shows me that I should have included in my paper a sketch of the VAWT I just described, and I apologize for not having done so. You assert that my Sharp Cycloturbine models on YouTube have “quite a few moving parts”. Well, to be more specific, the rotor has 4 moving parts: the main body and the 3 blades. The blade bearings are a continuation of the blades. Modern HAWT with variable pitch blades have far more moving parts than that. So your comment could be regarded as a criticism of modern HAWT for having more moving parts than a Sharp VAWT. Is 3 parts still too many parts? Fixed-blade have one moving part. 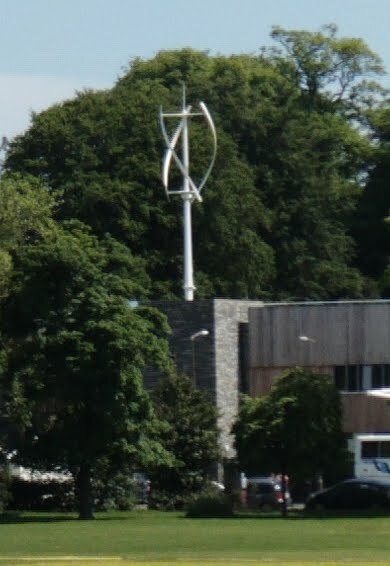 So are they the best wind turbine? Maybe the number of moving parts is not the best criterion for predicting reliability. More moving parts are assumed, under KISS, to result in reduced reliability. But for the blades of the Sharp Cycloturbine, the opposite is true. Based on the physics involved, blade stresses are reduced. And there is very little pitch-bearing wear because the bearings are cords that only twist back and forth a few degrees. I tested cord bearings for 2 million cycles with no sign of wear. That is not a conclusive test, but it is at least another bit evidence in support of my claims. KISS is a good rule of thumb, but as with all rules of thumb, there are exceptions. Because of the way the Sharp VAWT blades are suspended and free-floating, the cyclic loads on them are greatly reduced. Their pitching minimizes the forces on them as compared to fixed-blades. Please consider this example: A car without shock absorbers is certainly simpler, with fewer moving parts, than a car that has them. But which car would be more durable, more reliable, and require less maintenance? A car with shock absorbers clearly contradicts the KISS rule of thumb and demonstrates that there are valid exceptions to it. Sometimes, more moving parts produces a higher reliability rather than a lower reliability. Your legitimate concern about blade fatigue derives from the early eggbeater VAWTs where the very thin, very long blades were not strong enough to resist the cyclic loads resulting from the up and down motion of the blades. But it would be a mistake to assume that all blades on all VAWT suffer from that same fatigue problem. They don’t. That problem has since been solved for eggbeaters too. Please note that my Sharp VAWT models on YouTube are practice models that are iterations for developing a kit for school children to learn about VAWT in the classroom. They are intended to be extremely cheap, and simple enough for kids to make. The V-blades are folded paper, and the blade bearings are chalk cord. Clearly, they are not prototypes for full-scale VAWT. With paper blades!? Their purpose is only to illustrate, and teach about, what seems to be the best form of pitch control for VAWT (at least for small-scale VAWT). Are you perhaps assuming that those are the only models I have ever made? In my paper on the Sharp Cycloturbine I include two photos of others that are much more powerful (and too dangerous for children), and there are many I didn’t include. You are concerned about untested claims, as you should be. But please consider that most research is “just claims” (your words) to be tested. They are more formally called “hypotheses”, as you know. Obviously, my hypotheses need to be tested. Of course. Most definitely. Unquestionably. But if I didn’t assert them, how could they be tested? Should I test them before asserting them? And what exactly is a conclusive test? A commercial VAWT with 20 successful years in the field, and a production run of at least 1,000 turbines? How many wind turbines could pass that test? I am careful to show my evidence accurately and to cite the relevant academic research, and my own experimental observations, that support each of my claims. I don’t make claims without good evidence to back them up. I respect science. I’m not trying to sell anything. I’m not trying to boost my ego. I am trying very hard to get my concepts tested. The main problem I run into is that researchers want me to test my windmills first so that the researchers will have enough confidence in my VAWTs to build and test them themselves. Catch-22! But that is because they don’t understand them, and it’s hard to have confidence in something that one does not yet understand. If and when I can make videos of larger models producing electricity and pumping water or air, that situation may improve. Incidentally, I noticed a comment by Jeff Doyle about his (delightful) micro Sharp VAWTs showing signs of wear. Please be aware that his blades and blade bearings were not the same as mine, so his designs do not necessarily reflect on my own designs. Please understand that I’m not a VAWT partisan. For example, I recently sketched designs for new kinds of HAWT to be used as energy kites. My interest is not in claiming a superior VAWT but rather in improved windmills and wind turbines of any kind based on inventing new principles or new ways to use existing principles. Thanks for your kind attention to my comments. I apologize for their length. I don’t have the energy for a prolonged ding dong debate where you say that the fatigue problem has been solved and I say it has not. I just go back to saying the proof of the pudding is in the eating and for a hundred years of brilliant ideas we do not have a market ready VAWT that I can see. I will pick up on one thing though. You say “Just stack extra-wide Sharp VAWTs, with spaces between the VAWT, to create one very tall VAWT. Problem solved.” That may solve your problem, but all I see is a larger effective projected swept area and therefore lower efficiency in real terms if we are being honest with how we define swept area. Using gaps in the middle of the rotor to bring in extra wind energy and then claiming to be more efficient is cheating. If it actually were more efficient in terms of the complete size of the device then it would likely be done that way. Similarly tilting the rotor and claiming not to increase swept area is another similar cheat. Clever but futile. Playing with the numbers to pretend you get better efficiency does not make for a better turbine in the real world. Sorry if I am being a bit harsh but can’t be bothered with this stuff sometimes.